* Proc. Zool. Soc. Lond. 1840: 92 . The Eastern Wallaroo (Macropus robustus robustus) also known as the Common Wallaroo or the Hill Wallaroo is part of the Wallaroo family (Macropus robustus). It is a large, variable species of macropod (same as the Kangaroo). Many mistakenly believe that the Eastern Wallaroo and the Euro the same species, but they are actually two distinct sub-species. The Eastern Wallaroo (Macropus robustus robustus)- which is grey in colour - occupies the eastern slopes of the Great Dividing Range and the Euro (Macropus robustus erubescens) - rufous in colour - occupies land westward. 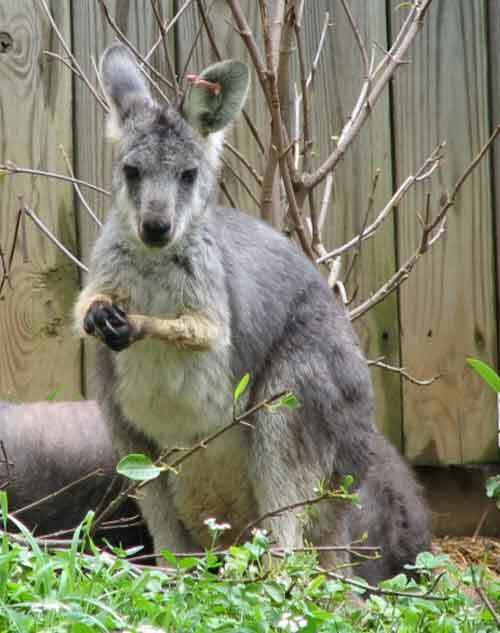 The Eastern Wallaroo is mostly nocturnal and solitary, and is one of the more common macropods. It makes a loud hissing noise and some subspecies are sexually dimorphic, like most wallaroos. M. r. robustus - Found in eastern Australia, males of this subspecies have dark fur, almost resembling Woodward's Wallaroo (Macropus bernardus). Females are lighter, being almost sandy in colour. M. r. erubescens - Found on covering most of its remaining range, this subspecies is variable, but mostly brownish in colour. M. r. isabellinus - This subspecies is restricted to Barrow Island in Western Australia, and is comparatively small. It is uniformly reddish brown. M. r. woodwardi - This subspecies is found in the Kimberley region of Western Australia and in a band running through Northern Territory. It is the palest subspecies and is a dull brown-grey colour. The Eastern Wallaroo as a species is not considered to be threatened, but the Barrow Island subspecies (M. r. isabellinus) is classified as vulnerable. ^ a b Groves, C. (2005). Wilson, D. E., & Reeder, D. M, eds. ed. Mammal Species of the World (3rd ed.). Baltimore: Johns Hopkins University Press. pp. 65. OCLC 62265494. ISBN 0-801-88221-4. ^ a b c d e Menkhorst, Peter (2001). A Field Guide to the Mammals of Australia. Oxford University Press. p. 118.